Q. What makes Sports Picker Different? A. 98% of Sports gamblers lose money over the long run. This is why sports books make so much money. 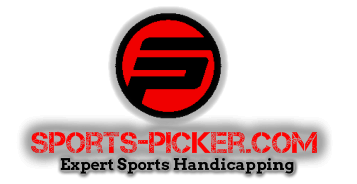 What makes Sports Picker different is that I have a proven track record and my systems are based on a validated computer system. I even post my free picks to sits like http://www.bestsportspickstoday.com to provide third party proof that my picks win for real. My picks are based on Value investing. This means that I predict the true value of a line or the actual expected outcome and compare it to the line offered at the sports book. When there is a difference in our favour, I make a play. My bets are based on my own proprietary system. See below for more details. Note the Monthly results - The 5th guy down hasn't even earned 3 units! 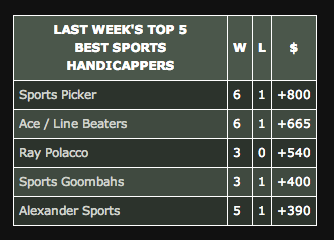 This shows how many handicappers are complete frauds. Before you invest in a handicapping service make sure you review the results and if possible look for third party validation of the picks. Q. What is your Record? A. This is always a great question and the answer is very important. I don't focus on Win/Loss record as a % of games played. I focus on Win Loss record based on $ or units wagered. This is one of the most fundamental mistakes I see amateurs make, they focus on trying to get a high win% but don't focus enough on how much money they are making. The reason I am a consistent winner is because I focus on finding high value bets on underdogs or money line / puck line bets with High Payouts. This way when I am right on a game I am highly rewarded for it, which typically results in my wins covering my losses. NOTE: This may result in slightly higher bankroll fluctuations but when we hit a few winners in a row the payoff covers the losses. To view my latest results click here. Q. How often do you send picks? A. VIP plays are send daily, FREE plays are sent a couple times per week. Q. How do I get my picks? Q. What Sports are Covered? A. I cover most major league Sports with a higher level of focus on NCAA, NHL and NBA. I also cover MLB, MLS, World Cup and occasionally european soccer and golf. Q. How do you make your picks? A. My picks are based on a proprietary system that I developed with the help of a friend in investment banking. We built a complex computer system that predicts the spread and odds for each game. It includes statistical factors such as win loss and previous performance, as well as situational factors such as travel, most recent performance and motivation factors. I then compare my predicted odds to the lines and odds offered by the sports books. This allows me to identify the largest gaps and make high value bets. You will notice i often provide my predicted odds or spread and in my email write ups that explain where the gaps exist. NOTE: This is very common in major sports and is one of the fundamental reasons my system works. The Sports Books don't care what the actual line should be. All they care about is that they get equal amounts of the publics money on both sides of the line. This is where our advantage comes from. Finding the lines that the sports book shades to one side or another. Q. What time do you send your picks out? A. VIP plays are sent out most days by 5pm EST at the latest on Weekdays. Usually much earlier. On weekends I send out plays a few times per day as I complete my analysis. I always try to provide at least a hours buffer before the game starts. Q. How do I know your record is for real? A. You are free to follow along for as long as you like to see the FREE plays win consistently. 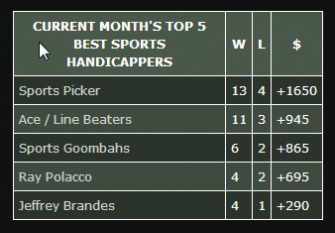 I have also joined some third party services like www.bestsportspickstoday.com where I post my FREE picks to compare my performance against other handicappers. 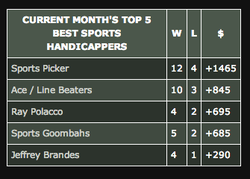 I started doing this in March 2014 and my results for March are far outpacing all other handicappers. The image to the right is an actual screen shot from Best Sports Picks Today. Note- I will not always be posting my plays here for FREE as my best plays are reserved for my VIP subscribers. I have used the FREE posting site to provide proof of my picks. Q. How many VIP plays are sent per day? A. It depends on the games and the value in the lines. I usually try to have 1-4 VIP plays per day. Q. Do you provide guidance on how to bet? Q. What info is provide with the VIP plays? A. I provide the exact line, the sports book I got the line from, my unit bet, and a brief write up explaining my thinking for the play. Here is an example of a VIP Client email - You will notice I have listed my predicted along with the line offered at the Sports Book. This game was a winner as Boston cruised to a 4-1 Victory. A. Yes I offer a guarantee on Weekly and Monthly package. As my system is based on value betting there may be some minor fluctuations week to week. If by chance we have an off week simply send me an email and I will be happy to extend your subscription until we are back in the black. PLEASE DO NOT CALL YOUR CREDIT CARD COMPANY OR CANCEL THROUGH PAYPAL. I WILL ASSIST YOU IF YOU ARE HAVING TROUBLE. Q. What Sports Books do you recommend? The bottom line when selecting a Sports Book is that you pick one that consistently provides competitive lines. I personally prefer 5Dimes. as they have a reduced juice option that offers lines at -105. This makes a big difference over the long run.